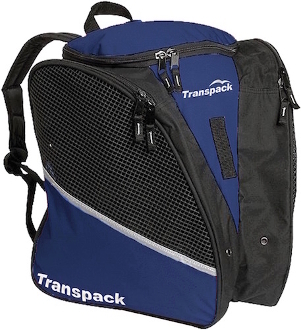 Transpack Solid Navy Ice Skating Bag. Isosceles Storage System that carries skates, helmet and gear. Made from super tough water resistant 600 denier coated polyester. Double locking, self repairing nylon coil zippers and air/water drainage grommets. Adjustable foam padded shoulder straps. Internal zippered pocket shelters personal items. Large water resistant central compartment. Mesh vents on top of each side skate pocket.